I made my best friends during my college days while I was doing my post graduation when I was away from home and staying in the hostel/dome. We were the Trio. We used to go home together for the study leave and vacations. There was an excellent chemistry between us. We were together in trouble and fun during the hostel days. I remember our first cooking experience. It was with one of the Trio who was from Trivandrum. Her parents were not home at that time, so we decided to explore our culinary skills by trying out some lemon rice. It was a flop; it turned out to be sticky bitter tasting rice. As novice cooks we didn’t care for the measurement and used lot of rice for our experiment, so the task to clean up the kitchen without any evidence and cover up the mishap was not as easy as we thought. We had to clean the scene before her parents were back. After pondering a bit she came up with an idea and I concurred with her. We waited for night. Then the actions took place very quickly on the terrace of her house. The lump of sticky rice was transformed in to small balls and we threw the balls into the next plot where nobody was living at that time. We pretended as nothing happened and I believe she knew how to make rice and she made another batch of rice for dinner as nothing happened. That was just one incident among many that makes me chuckle even today. We used to stay in a hostel run by nuns. The horrible food and the strict study hours were the tortures we used to tackle together. I was the sleepiest of all and my friends will signal me before the nun comes for the rounds during the study time. We made friends with the cook in the kitchen and used to get some extra goodies from her...lol. We were the partners in crime. We moved together to a better hostel later. After our final exams we left the hostel and promised to be in touch with each other. We used to call each other for some time. I then pursued my professional studies and went farther away from them. Years later everyone got married and started their lives. Then we all got busier with our lives and slowly lost contact of each other. I literally lost all contact info of the other two, but I used to search them in social media all the time with no luck. Couple of weeks ago I tried the Trivandrum phone directory and found out my friend's home address, but the phone number was not under her father's name, but I decided to make that call. It was early morning there, but the female voice on the other side told me that she had heard my name many times. It was my friend's brother's house. I was thrilled to find out that she still talks about me even after so many years of no contact. I finally got her number from her sister-in-law and made my first call after years. The voice at the other end sounded the same as I had heard years ago. I said 'Its Shibi' and I wanted to be witty, so asked if she knows any one named ‘Shibi’. The answer was 'I know only one Shibi'. That was the best overwhelming answer I could get from a long lost friend. I wasn’t sure where to start. I think I did most of the talking; she was listening. It was late night for me, but I wanted to wake up my hubby and kids who were in sound sleep and shout out my joy. I was eagerly waiting for the next morning to break the news to my family. It was really exciting and thrilling. Last weekend I was talking to her and she inquired me about many recipes pictures she saw on my fb wall and thought I was simply sharing someone’s recipes. I couldn't stop laughing because she knew me well; she never expected it from me as my cooking passion was never unveiled to anyone at that time, not even to myself!! We shared our nostalgia of the first cooking experiment and some college day’s memories. Now we are trying to find the third lost link in our TRIO!! Hope we can find her soon. 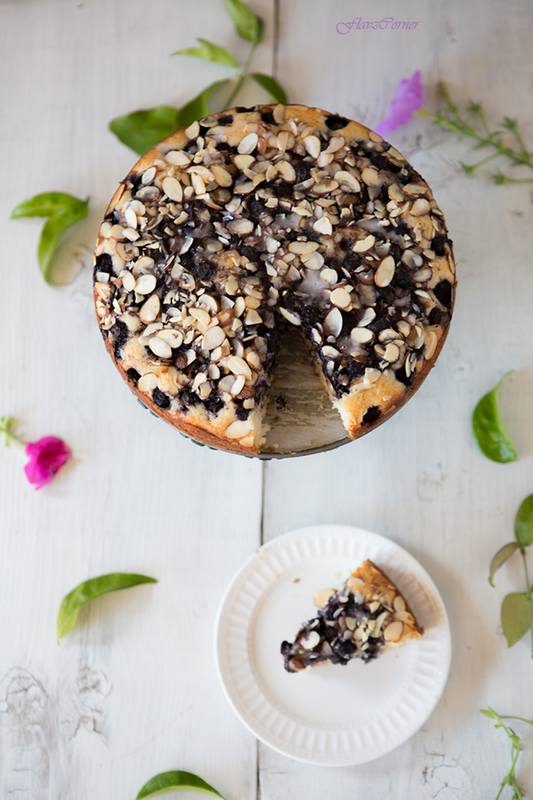 Today I am sharing a recipe for a simple coffee cake that you cannot have enough of it. There is no tricky ingredients and the method is quite simple, but the resultant cake is totally addictive. 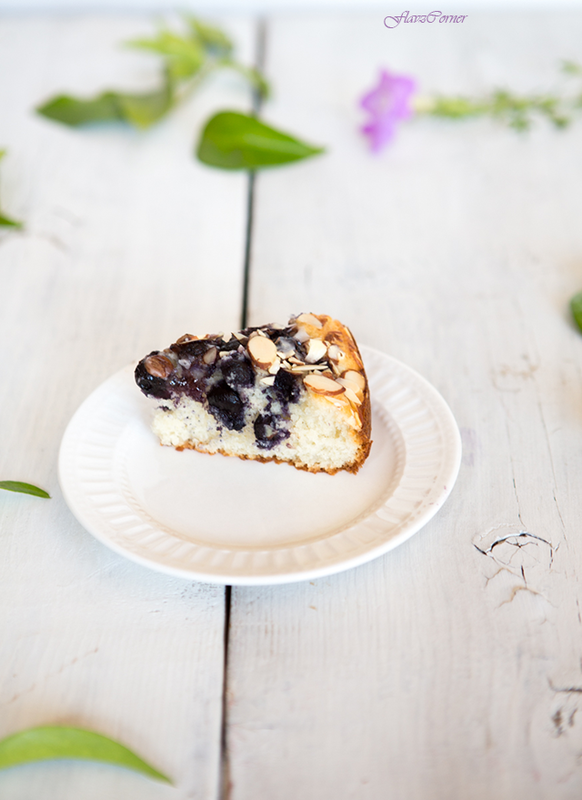 The combo of cinnamon and blueberry and the crunchy almond slices is the highlight of this coffee cake. So don't skip cinnamon if you are planning to make this cake. 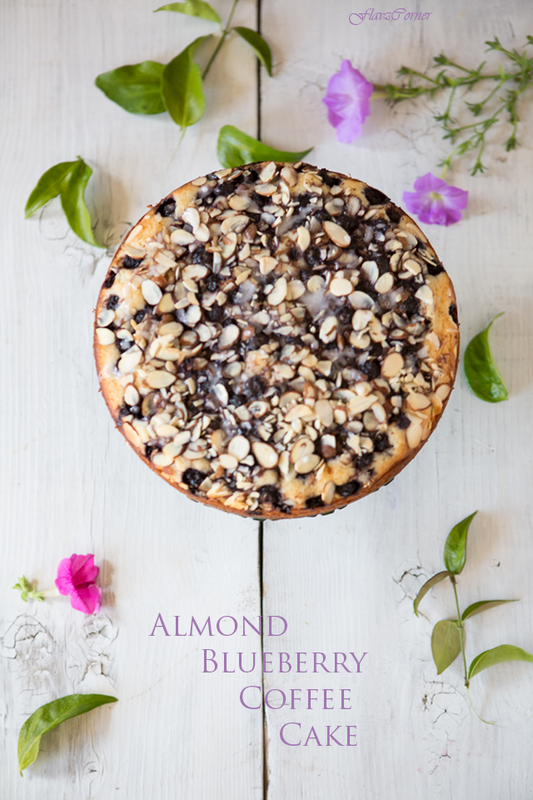 The soft texture of the cake base remains soft even when left outside. My whole house was smelling incredibly good when I baked this. So waiting long for the cake to cool down completely was not an option for us, I won't blame anyone, it was all my fault that I baked it ...lol. Please give this recipe a try and I am sure you will like it. Pre-heat oven to 375° F/190° C. Grease a 9 inch round cake/spring form pan and line the base with parchment paper. Sift all purpose flour, salt and baking powder together and keep it aside. Cream together the softened butter, egg and sugar in a mixing bowl of stand mixer with paddle attachment or use a hand mixer for this. Add plain yogurt, vanilla and milk and mix well. Slowly add the sifted flour mixture into the wet ingredients and mix till there are no lumps and everything is incorporated well. Pour the batter into the prepared pan and level the top using a spoon. Mix the blueberries, cinnamon and sugar together and gently push the mixture on the top of the batter using the base of a spoon. 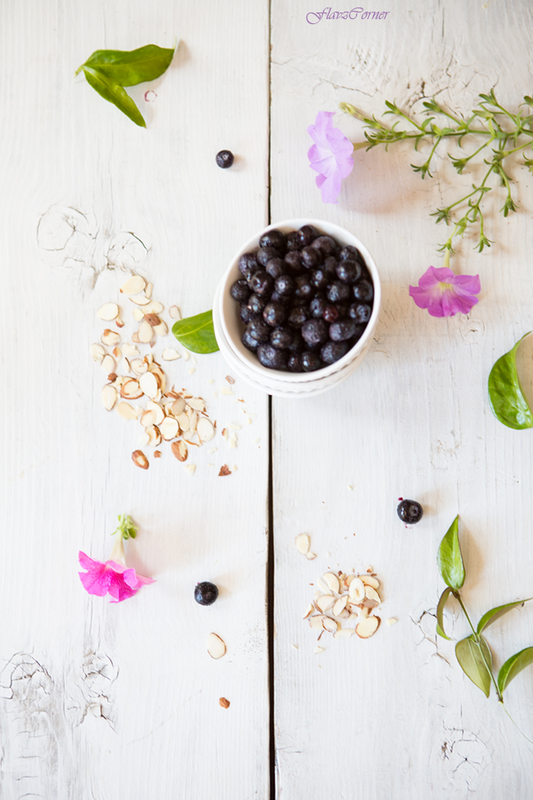 Sprinkle sliced almonds on top of the berry mix evenly. Bake for 35 to 40 minutes till a tooth pick comes out clean when tested on the center of the cake. 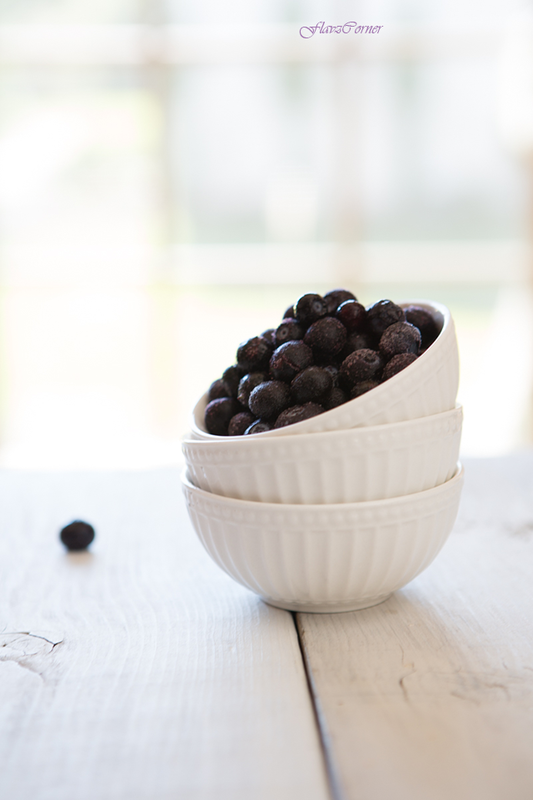 The sides of the cake will get a golden brown hue and the blueberries will be popped on the top. Let the cake cool for 20 minutes. Meantime prepare the glaze by mixing the powdered sugar with milk and mix well. Spoon the glaze over the cake. It is really irresistible and it will be really hard for you to wait for the cake to cool down completely, so slice them and enjoy them while they are warm. Beautiful story and amazing looking cake! the cake looks amazing.,..I just can't stop starring at it which has left me hungry now...shooo.. I want a large slice! It looks heavenly! Beautiful cake hee hhee somebody else's. Have fun connecting. Lovely post -- so nicely written. And this cake? Yes. Please. ;-) Really fun read -- thanks so much. Blueberry cakes are so delectable. Yum!